This is such a fun and entertaining show. My daughter is three and she loved all the sing along songs. This show reminded me of so many other fun and creative shows out there. So if your child is a fan of The Wiggles, Four Square or Yo Gabba Gabba they will definitely love this show and all the characters. My seven year old son watched a bit as well and he loved that the show had lots of adventure with a mix of crime fighting included as well. Definitely a win in their book. I would for sure let the kids watch more of their up and coming shows as they were funny and kept my kids entertained for a bit. Disclosure: All opinions are my own. 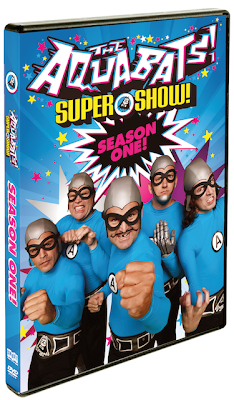 I received The Aquabats Super Show Season One on DVD at no cost for the purpose of this review. No other compensation was received.